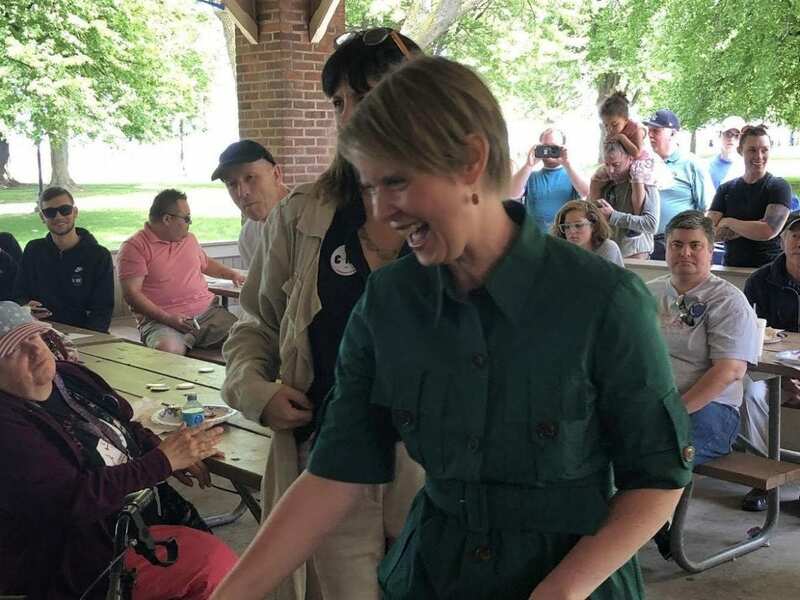 ROCHESTER, NY (WXXI) – Democratic gubernatorial candidate Cynthia Nixon brought her campaign to Rochester on Sunday, specifically to focus on the needs of the disability community. Nixon met with a variety of supporters, including those active in the disability community locally during her campaign stop at Ontario Beach Park. The actress and activist who is hoping to face Democratic Governor Andrew Cuomo in a September primary keyed in on several points important to those with disabilities, including low wages for home health care aides. Nixon said those wages need to be raised to help people with disabilities stay in their homes and be contributing members of their community. “We don’t want a state government that will prioritize hospitals and incentivize getting people out of their homes, to pay, by the way, much more for care than we could if we allowed new Yorkers to stay in their homes,” said Nixon. Nixon said she is fighting for basic needs that all New Yorkers, not just those with disabilities, have a right to. “These inequities are so much more pronounced; the disability community wants what all of us want; we want access to good education, we want access to affordable housing, we want access to transportation,” she said. Colleen Flanagan, executive director and co-founder of a national organization called Disability Action for America, which is endorsing Nixon. Flanagan notes that a number of activists gathered last year in Washington to protest against possible cuts in Medicaid. Flanagan says her group is backing Nixon because they feel she will be more proactive than Cuomo in address issues of important to the disability community. It was Governor Cuomo who led the nation by enacting a $15 minimum wage to lift up more than 2.3 million New Yorkers and restore fairness to our working families. This year’s budget delivers more than $1.4 billion in critical funding for home healthcare workers to support this landmark wage increase and builds on the state’s additional efforts to increase accessibility, expand new services for at-home and disabled New Yorkers, and support fair housing for all.